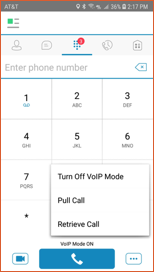 If you have a call that you answered on your desk phone, but would like to transfer it to your client, use the Pull Call feature. To pull the call from your desk phone to your client, go to the calls tab and press the menu in the lower right. Choose Pull Call from the menu.